If you’re looking to find one of the best belt sanders on the market, you have come to the right place! This particular review post is designed specifically to make sure you know everything there is to know about belt sanders. To begin with, you’re going to learn how you should choose the best belt sander as well as what the benefits and disadvantages are going to be. In addition, you’ll see product reviews from five of the top products on the market. From these reviews, you’ll learn a lot about what each product can offer and you will have no problem making a smart and informed decision when it comes time for you to buy the best belt sander. 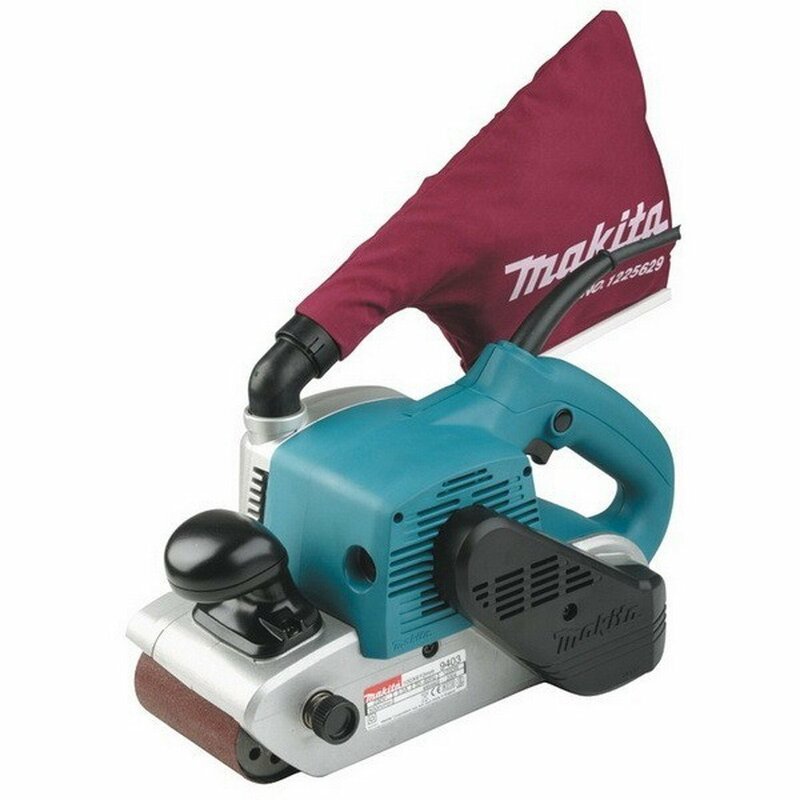 One of the better brands you are going to find when it comes to sanders and power tools in general is Makita and you’re going to love this particular sander and everything it has to offer. Perhaps one of the best features about this particular sander is the fact that it is going to be one of the quietest sanders on the market and its class thanks to the low noise level of just 84 decibels. Additionally, the four-inch wide belt works at a speed of 1,640 feet per minute so you get incredibly fast material removal. Furthermore in terms of the features and specifications of this particular sander, you’re going to enjoy a great construction material along with a sealed motor and bearing to keep it free from any contamination. The large front grip is positioned in the right place so that you enjoy incredibly comfort at all times as well as maximum control. This sander as a whole weighs just 13 pounds and comes with a one-year warranty to keep you covered at all times. If you liked the sander that was reviewed above but you might want to find something a little different, this can be one of the best choices for you. It is similar when compared to one of the other sanders that was reviewed above in the fact that it comes with a powerful 8.8 amp motor and it operates at a very low noise level of just 85 decibels at its loudest setting. One other feature you are really going to love is the variable speed control dial that helps to enable the user to match the speed of the sander to the material that they are sanding. In addition to everything else, there is an auto-tracking belt system that helps to track the belt without needing any adjustments. The innovative design of this sander helps to make it possible for flush sanding to the wall with the nose and side of the sander. 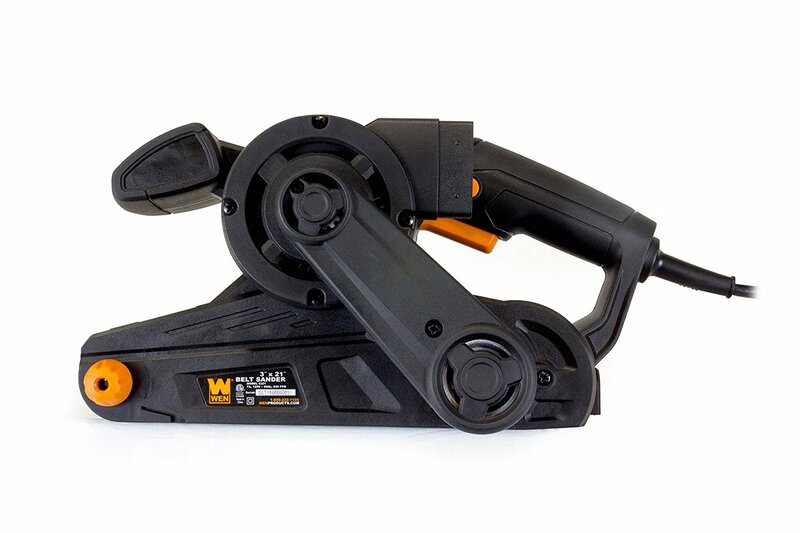 Last but not least, the front grip design is perfect for comfortable operation as well as providing complete control over the operation of the sander. If you want to find something different than one of the Makita brands that was discussed above, this can be a great choice because even if the price is a little more expensive, it is well worth it. This comes with a powerful 12 amp motor that helps to provide professional power at all times. The motor is located in a specific place to help ensure you get maximum performance and perfect balance at all times. Additionally, it is specifically designed for flush sanding to vertical surfaces for the best results possible. Furthermore, you’re going to enjoy the variable speed dial that is conveniently located on the handle so that you can quickly and easily adjust the speed of the belt anywhere from 1,000 to 1,500 SFPM. The quick-release belt change lever helps ensure that you can easily change the grit of the sanding paper with little to no effort. Lastly, you’re going to get a 100G belt, a dust bag assembly as well as an operating manual so you can do everything you need to do with this sander. If the most important thing for you is to work on a budget when picking out a belt sander, then you will find that this sander is a great choice because it is one of the most affordably priced options on this post. 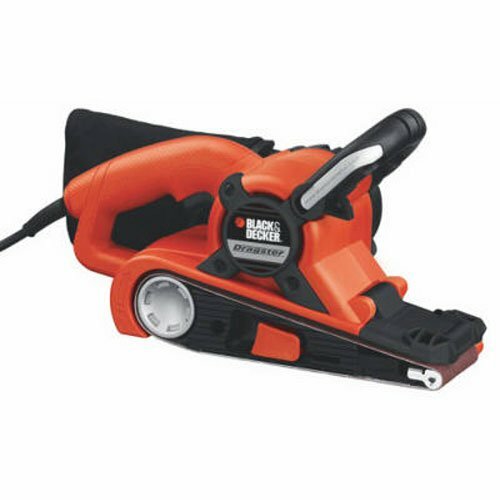 Black & Decker is one of the better brand names that you can trust when it comes to power tools and this sander is one of the best and highest quality sanders in its class. 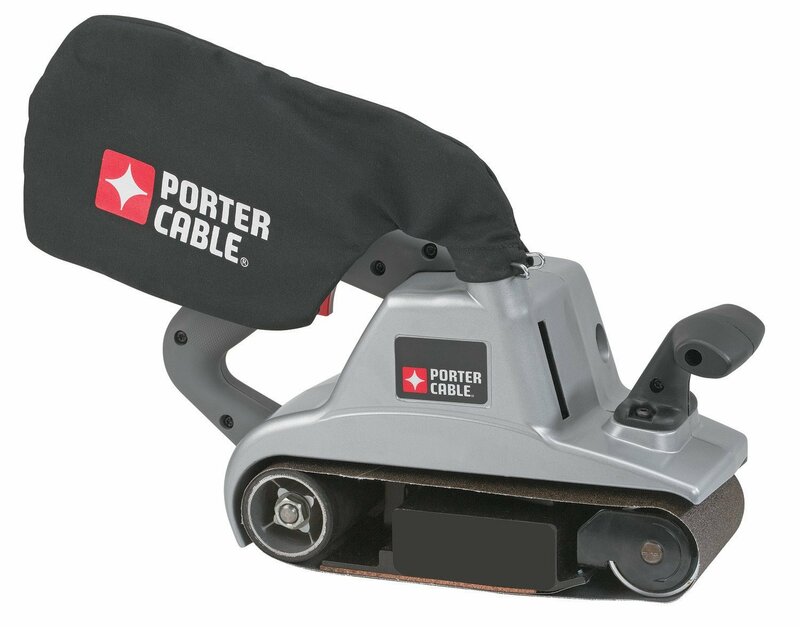 In terms of the features and specifications, you’ll find that the innovative front roller helps make it easy for you to reach tight corners that you might find when it comes to you sanding all sorts of material. Furthermore, you’re going to enjoy a retractable, three-position handle that helps to give you a comfortable grip at all times along with optimum control over everything you do with the sander. Last but not least, you’re going to enjoy a cloth dust bag that helps to significantly reduce the amount of dust and debris that enters your work space where you do your sanding. 5. WEN 6321 7 Amp Heavy Duty Belt Sander with Dust Bag, 3" x 21"
Much like the previously reviewed belt sander on this post, this is going to be another reasonable and affordable option for you to choose from when it comes to a belt sander with a lot of great features. The seven amp motor on this particular sander works to rotate the belt at an amazing 13 feet per second and the compact design helps this sander to weight only 6 pounds so that you can easily get great results at all times since you won’t have to fight fatigue when it comes to using this sander on a daily basis. In addition, you’ll find some other great features including a detachable dust bag that works to really minimize the clean up you have when you use the sander on a regular basis. Furthermore, you’re really going to enjoy the lock-in safety feature to allow for continuous sanding without need a constant grip on the trigger at all times. Last but not least, this product is backed by a two-year warranty and a massive network of skilled technicians to help you when any problem might arise. When it comes down to it, you will have no problem picking out the best belt sander thanks to all of the information that was provided above. Not only do you get to read five reviews of the best products that you can find on the market, but you also got to read all of the important things you need to keep in mind when it comes to picking out the best belt sander for you. With this information in mind, you will easily be able to pick out a belt sander that meets your needs and excels at all of the jobs you need it for. One of the most important things for you to keep in mind when it comes to buying a belt sander is which unit you want to buy. In general, you are going to have your choice between an inline unit or a transverse unit and you need to know the difference before you make any sort of decision. First up is the inline unit which is the best option for anybody looking for portability over anything else. In addition, you’ll find that these units are easy to use and manage for individuals with little to no experience. However, these units make for a really poor choice if you are looking to complete a bigger project that requires extensive work. If you don’t want an inline unit, then you’re next option is to go with a transverse unit and these are going to be the best choice for anybody that wants to get a more durable sander that is stronger and can be used each and every day. While these units are able to handle some of the bigger and larger projects you face, they face a big downfall when it comes to the portability of the unit. If you’re okay with sacrificing portability for high power, a transverse unit is the way to go. When it comes down to it, it’s important for you to figure out where you plan on using the unit. Typically, you’ll find that a belt sander is designed mainly for large areas and jobs where some more rough sanding is needed. As mentioned above, you need to consider the portability you need as well because that can dictate which type of sander you will buy. Overall, you’ll find a belt sander is perfect for anyone looking to sand doors, tabletops or any materials looking for a quick finish. When it comes to the power of the sander, it is one of the most important considerations you need to keep in mind. Typically, the power of the sander is going to come from one of three power sources: battery, electric or even an air compressor. The electric motor is a great choice for anybody looking for portability but the air compressor can help to deliver the best power when it comes to the sander. When you make the choice regarding what type of sander you want to buy, spend a lot of time when it comes to the power source. As unfortunate as it might be, the safety of the sander you want to buy is often one of the more important considerations you want to keep in mind because it can make a massive difference when it comes to life or death when using the sander. Luckily, there are a lot of great safety features on sanders on the market today so make sure you keep those in mind and find a sander with those features. As an example, you should look for something that ensures you have a safe and secure work environment around you. Additionally, make sure you always wear earplugs and safety goggles when you are using the sander. This has already been touched on in some of the points already mentioned above but it is one of the more important things to keep in mind for people who plan on bringing the belt sander with them from place to place. If you do want to find something that is portable for you to bring everywhere, I recommend looking for a small and compact sander that still has plenty of power and great features. You want to make sure you have the portability at your hand, but it is not worth giving up a ton of features and power just to have a compact unit. Sanding is one of the best things you can do but the dust and debris it creates is easily one of the worst things when it comes to trying to keep a nice and clean workspace around you. No matter what, you can get really annoyed with sand and dust flying everywhere do you want to make sure you get a solid dust collection system attached to your sander. In some situations, you can find a sander that picks up the majority of the debris around you and that might be enough. however , if you want to spend some more money, you can find a dust collection system that picks up and collects even the smallest dust particles so you never have to worry about the debris around you in your work area. Unless you are only using the sanding belt for one particular thing and nothing else, you’re going to need to change the belt throughout the time you are working on it so it is important to get a belt that comes with an easy change system. If you find a unit that is difficult for you to change, you’re going to get easily frustrated and it will lead to more time changing out the belt than actually working. You might not see it as a big deal at the moment, but once you get the belt sander, you’re going to love an easy change belt system. Whenever you buy any power tool or something similar, the ease of use is one of the more important things to keep in mind because you want to make sure you have an easy working experience so you don’t hate using the sander. When it comes to picking out the sander you want, I recommend looking for something that is easy for you to use, has an easy control panel and clear instructions. The easier it is to use, the better off you will be when you work with the sander. When you look specifically at the benefits of belt sanders, there are quite a few that you will find and you’ll see that some of them were discussed above. Some of the top benefits you are going to find is that the belts are incredibly easy to use for just about anybody who needs to use them. Additionally, these belts do an excellent job at removing any unwanted surface residue on materials where other sanders might have a hard time doing so. Second to last, the belt sanders you find are suitable for soft metals because they will not get clogged like other sanders do. Lastly, the biggest benefit of a belt sander is they work incredibly fast and they have a wide range of uses so that they can be used at just about any time you need them. I believe there is a handyman in all of us as long as you have the right tools. I started this blog to help anyone who is interested in fixing things to learn their way around the different tools and to know how to perform different DIY tasks. I have been doing this for years and believe I am a master of this art.